23% of users abandon an App after one use…mais alors comment l’éviter ? Mobile has emerged as a way of life for consumers. As mobile continues to grow in importance, so have consumers’ expectations for it. Unfortunately, businesses haven’t innovated at the same rate, which is one of the reasons we believe businesses are in a mobile engagement crisis. The data proves it. The percentage of users who abandon an app after one use is now 23%. But clearly, with about one in four users still only using an app once, not enough has been done to match what consumers want and restore apps to the success of just a few years ago. User Retention: The percentage of users who return to an app eleven or more times. In the study […] user retention reach 38% in 2016. While this number is also an improvement, there is still work to be done in order to avoid churn and ultimately convert more users to loyal customers. Because even though 38% will return to an app 11 or more times, that means a whopping 62% will use an app less than 11 times. On the other hand, user abandonment (those who only launch an app once) made only a slight improvement, dropping from 25% in 2015 to 23% in 2016. While the progress does not go unnoticed, the percentage of users who only try an app once is still high. This slight progress in user retention is nothing to rest on. We believe apps are at a tipping point when it comes to mobile and what companies do now will determine how successful mobile engagement will be in the near future. The areas spelled out above explain why user retention improved this year, but we wanted to leave you with one powerful idea on how you can improve user retention. Today, we often hear about the power of push. However, it’s often overlooked cousin – in-app messages – also has a dramatic effect on user retention. Apps utilizing in-app messages see 46% of their users come back 11 or more times, while apps who do not incorporate an in-app strategy see that number drop to 36%. 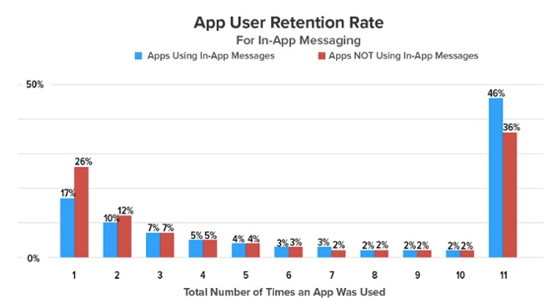 In-app messages also have an effect early on in a user’s lifecycle, as only 17% of users will only use an app once if they see an in-app message, while apps not utilizing in-app messages see 26% abandoning the app after one session. Since users do not have to opt-in to in-app messages, they can be a great way to onboard users to the app and then keep them engaged with the most useful features of the experience. If used effectively, and personalized to the user, in-app messages are a strong tool in an app’s arsenal to keep users around. Article suivant Article suivant 2014, 2015, 2016…. c’était quand alors l’année du mobile ? Appli m-commerce vs site mobile : faut-il choisir ? Quid du multi-écrans ?